As mentioned in a previous post, the Antigonish Townhouse has begun brewing test batches in their brewery, located above the bar. I contacted owners Rose and Terry to find out more about the pub and their brewing setup, and they took turns answering. Could you give me an idea on how the idea for the Antigonish Townhouse started/became a reality? 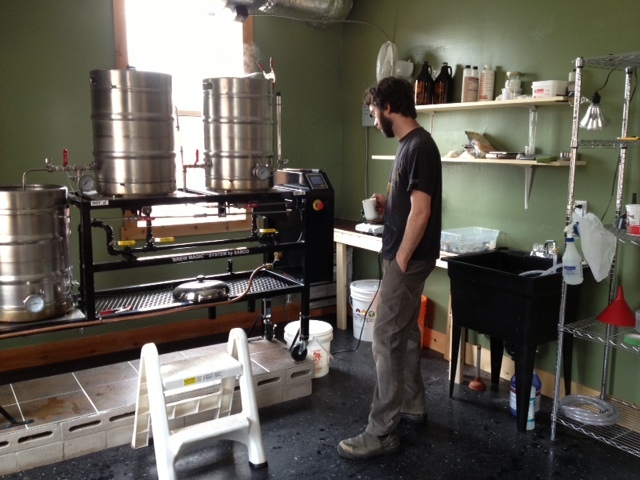 Rose: I guess a number of factors led us to the decision to open a brewpub in Antigonish. We were thinking about moving back to Antigonish. My sister and her husband were also moving back to start a serious market gardening project. I had been working for ACORN promoting organic food/agriculture in Atl. Can. and had gotten to know a lot of great producers in and around the Antigonish area. Terry had gotten very into home brewing and we thought it might be a neat way to combine our interests (excellent beer/excellent local food). I had opened a cafe in my early 20s but sold it to go back to school, only to determine I really missed the lifestyle of being on your feet, working with food, feeding and entertaining people, and getting to know lots of interesting people in the process. We also both really enjoy old knick-knacks and odd objects, and creating and decorating spaces – obsessing over lighting and how to make things feel the most cozy… Plus, a summer spent in Antigonish made it very clear to us that the town really needed a proper pub, so it all kind of came together when my sister suggested we move back and open one ourselves. The physical manifestation, of course, took quite a while longer. We had a very tough time securing a location – buildings were few, renting anything required copious renos, but no one would fund extensive renos on a leasehold. We launched a blog where we discussed our ideas and research, and gathered feedback from the community. It turns out there was quite a serious demand for a place just like what we were envisioning (over 500 people responded positively to our online survey). Gradually we developed a funding scheme inspired by a Community Supported Restaurant (or CSR) model used by a place called Claire’s in Hardwick, Vermont, that I had read about while working for ACORN. We sold 50 $1000 subscriptions for meals to be eaten in the pub to eager supporters. They are being repaid $1200 worth of food over 4 years in monthly food coupons. We also secured loans from private lenders within the community for $100,000. We sold the small house we had bought and completely redone (plumbing, wiring, everything) so we could put the profit into the brewpub. Eventually, we caught a break and were offered first refusal on the perfect building–it had housed cozy restaurants since the 50s, and already had a lovely mahogany bar, and full kitchen in place. None of the mainstream banks would touch us, even though we had come up with 40% of our total start-up costs and were buying a well-kept building, but after some convincing the local Credit Union got on board. After almost 3 years of dreaming, scheming, lots of research, number crunching and revising of plans, we launched the pub side of the business in July of 2012. We have 8 taps of Maritime craft beers, and a small kitchen that turns out lots of tasty, casual food featuring local meats, cheese, and produce whenever in season. Some complications came up (fuel safety issues) when we tried to get the SABCO BrewMagic system we’d bought from Ohio installed, so we had to set the brewing aspect to the side until we were able to convert an apartment upstairs into a small brewery. This takes a surprisingly long time when you’re working full time running a very busy pub we discovered. So, here we are, coming up on our first birthday, and we’ve only just sampled the first batch brewed on the premises and poured from our reconditioned Angram hand-pump! We’re hoping to finally launch our own tap of cask conditioned ale later this summer. Are you a homebrewer? Can you tell me about your experience with that? How long, favourite beers/styles, etc. Terry: Yeah, I’ve been brewing for 5 years give or take. I just fell in love with the process. A nice blending of science and craft with beery results. I’ve always loved the balance and simplicity traditional british ales. Can you tell me about the Townhouse brewery setup? Size, expected output, etc. Terry: It’s a 1/2 barrel Sabco BrewMagic system. Very small, homebrew scale. We’re starting off having only 1 house beer on tap so the scale should be manageable. We offer 8 other Maritime brews so there’ll be plenty of beer to choose from. I’m anticipating producing about 100+ liters a week. Eventually as we grow, I’ll look into a bigger system, but for now, this will get us started. Do you have a plan for which beers will be brewed there? Terry: I would like to produce one kind as our flagship (I guess our sole-ship) beer. It’ll be a traditional cask conditioned English bitter on an Angram handpump. We thought we’d go right for the cask conditioning because, not only does it suit the style best, but it’ll also set us apart from most other brewpubs around, and give us the novelty of having something that can only be enjoyed at our pub (sorry no growlers available). Down the road we may get into more experimentation, and may slightly increase our brewing capacity. But we’ll always be small and simple. What is your approach to beer style/recipe choice? Terry: Keep it simple. I’m not trying to break new ground here. I’m just going to try to produce a quality session ale that’s very drinkable and made upstairs from the place it’s dispensed. I admire those breweries that are pushing the limits and enjoy their beer greatly, but I always come back to the really well balanced, easy drinking English bitters. Any brewers or breweries inspired or assisted during the idea or startup phase? Terry: I’ve had lots of help from so many people in the province. The brewing community in this area is very inclusive and supportive. Kevin Keefe at the Granite Brewery has been particularly helpful on so many fronts from advice on building a coffin box for the bar, ordering us equipment using his accounts, and tonnes of beer and brewery advice in general. He’s made things a lot easier for us to get this far. Rose : We visited almost every single brewer and brewpub in Nova Scotia and a few more in TO and the Gaspé. We were amazed and very encouraged by how generous with their time and expertise all the brewers were. Everyone encouraged us to go for it, and offered support down the line should we need it. We ended up getting to know Kevin Keefe of the Granite Brewery very well – we are huge fans of his beers and were very much inspired by his lovely pubs, The Granite Brewery (now The Henry House) and Gingers. He has been a tremendous help to us, giving us advice, guidance, parts, and more whenever we need it, and letting Terry spend some time brewing with him on Stairs St. We carry his Peculiar and Irish Stout, and the Peculiar has been our best seller since day 1. The Townhouse has been open since July 2012. Can you talk about your success so far. Tell me about the clientele in Antigonish, are they looking for good food, good beer, good music, all of the above? Rose: Because of the CSR model and the SUDS Club – the group of over 150 people who made up our 50 subscriptions–we knew we had a fair bit of community support. That really helped to lessen the anxiety of launching a pretty ambitious (for us, anyway!) project like this. We were hopeful that it would work, but were nevertheless unprepared for the volume of customers coming through the door almost every day until Christmas! Our business plan had been built around doing lunch and dinner, 6 days a week. We quickly realized we weren’t able to keep up with the demand as our tiny kitchen, who were making everything from scratch, was cleaned out by 2pm, and had to be completely re-prepped again for dinner in only 2.5 hrs… Plus, our first chef got sick 2 hours into our first day and ended up being out for the first week or so. We ended up quickly switching to 4pm – Midnight hours, 5 days a week while we found our feet. The fellow who ended up being our head chef, my brother in law, Will, and the rest of our excellent crew put in an incredible number of hours in those first few months for which we were eternally grateful. We were so thrilled with the positive response, people loved the beer (I think the breweries were surprised how much we were going through) and seemed to really enjoy the food, and we stayed very, very busy all through the summer and fall. The Wednesday – Sunday, evening only hours worked really well for us, and we added Tuesdays in October, once we felt a little more able to keep up. The winter slow-down allowed us more time to work on the brewery, and to host some events (quiz night, readings, book launches, live music shows). The SUDS Club have proved an invaluable resource to us – not just as regulars, but they have been providing detailed and honest feedback, bringing friends and relatives in whenever they can, participating in our Sunday night Irish trad music sessions, helping us paint, supplying us with vegetables, donating well-worn conversation pieces for the walls, and generally helping us spread the word. We haven’t had to do any advertising (beyond helping to sponsor a few great community initiatives). We’re gearing up now to launch our own beer, have just opened the small patio, are able to introduce fresh local veggies and lobster to the menu, and are hoping for another wild summer season! I know you have beers from other great Maritime breweries on tap, can you speak about them a bit? Rose: We are really enjoying introducing Antigonishers to the pleasures of craft beer. Many of our supporters are homebrewers and afficionados already, but many are just getting into them. They’ve wholeheartedly embraced The Granite‘s Peculiar, our most popular offering, and their Irish Stout. Garrison‘s Hopyard is gaining legions of new fans, and we are pleased to see a growing demand for Pump House‘s powerful west coast IPA. Propeller Pilsener and Porter are other favourites, and we’re looking forward to the breweries seasonal offerings. We have also just added a tap of Big Spruce‘s Kitchen Party Pale Ale which has been going over like a house on fire, a great summer beer for the patio. When do you expect to have your beer on tap? Will you have an event to celebrate the launch? Terry: Very good question, and one that I’m asked quite frequently. I feel the pressure, but at the same time i’m not in a hurry. I want the beer to be something I’m proud of. So until it’s just right, we’ll have to wait. There’ll be something to celebrate the launch, I’m not sure what, I haven’t really thought about it too much. Rose: I’d say we’ll be having a pretty big party! Since answering my questions a few weeks ago, Terry has gone on to brew several more iterations of the house beer, tweaking the recipe and process. As the beer is cask-conditioned, it is still alive and changing, and perfecting is as much art as science. We’re sure it will be worth the wait, and keep you updated on exact release date. The Townhouse is at 76 College St., Antigonish, NS, (902) 863-2248, and can be found online at their website, Facebook and Twitter.